In recent versions of Skype (at least Skype 6.12 and newer), it's easier to record Skype calls. If you're using an older version of Skype where the "Same as System" option is not available, select "Screenflick Loopback" instead of "Same as System". Inside System Preferences, I have my headphones selected as the audio Output device as normal, and the microphone is selected as the audio Input device; you don't need to change your systems settings at all for recording Skype to work, but you may want to switch the audio output device to be your headphones so the other person's voice doesn't get picked up by your microphone. Microphone: This is the device Skype will use to listen to you talking. 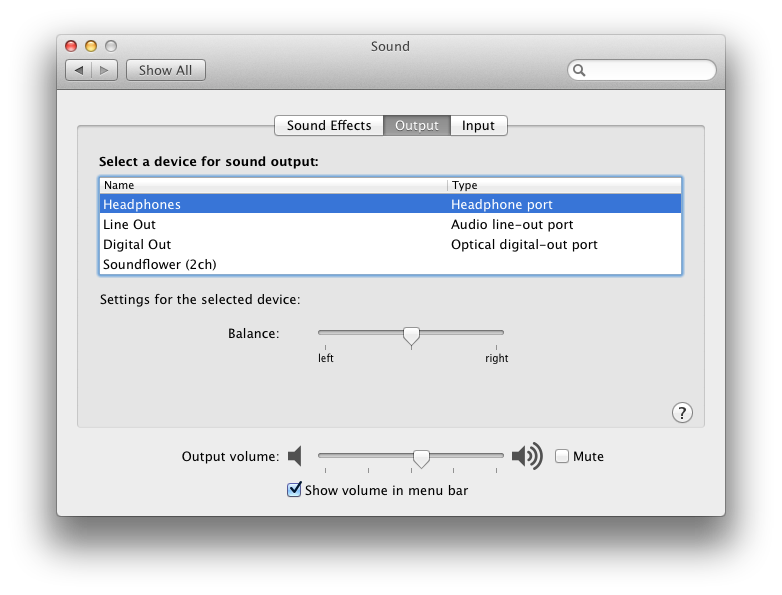 Note that it does not use the default audio input device selected in System Preferences. Ringing: When making a call, Skype plays a ring tone and other sound effects when the call is being made and ends. Speakers: The device chosen for this setting is the one which audio from the other person speaking will be played on. So with Skype, the sound effects and conversation can be played to two separate devices. Normally, these are both set to play to your speakers or headphones. What you want to do to record them in Screenflick, is set Ringing and Speakers to "Same as System". If you do not want to record the Skype sound effects, instead of selecing "Same as System" for the Ringing setting, you should directly select the speakers or headphones audio device from the popup. By doing that, it will bypass Screenflick's recording, so your voice and the other person's voice are recorded. 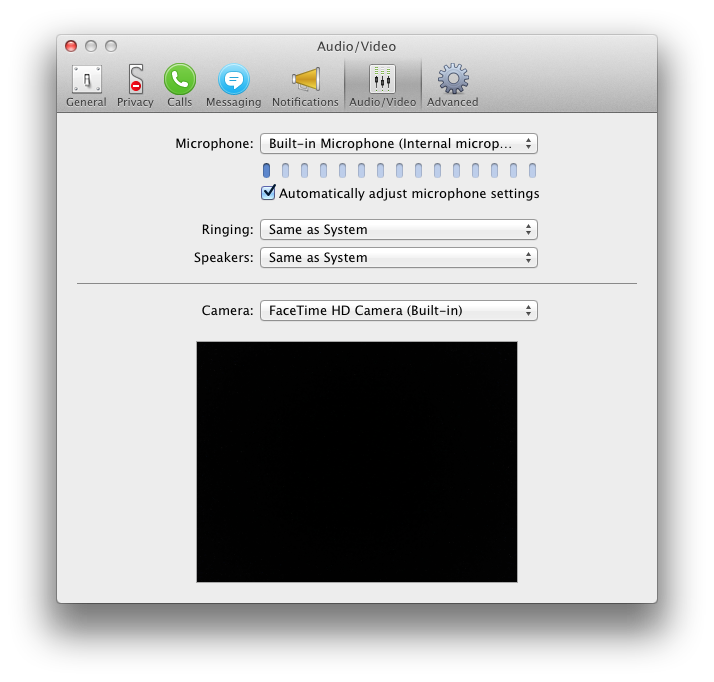 In Skype, select the microphone device, and set the Speakers popup to "Same as System". Lastly, Inside Screenflick, I select to record the Logitech Camera as the microphone device, and have turned on recording System Audio as well. Recording the microphone will obviously capture the sound from me speaking into the microphone, while recording system audio will be capturing all of the sound from the other end of the Skype call. 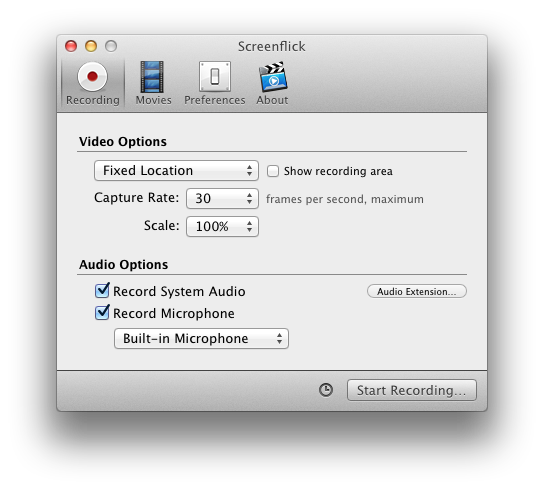 In Screenflick, select the same microphone device, and turn on system audio recording. There you have it. It may be a bit odd to setup the first time due to Skype's flexibility with its own audio device selection, but that flexibility lets you do some useful things in many circumstances, and it's still not too difficult.